Everyday brings about an opportunity that one needs to make a choice on. Whether to wake up with a positive attitude, choose to lose weight, eat healthy, go after that job opportunity that you might feel unsure about, or to take a risk at something you always dreamed of but were never motivated to step out of your comfort zone to experience the dream. Life happens from the moment you are born. People and circumstances influence your life from the onset of life, which continues past our dependency of others. Sure, we can sit back and blame our past, make an excuse to float along in life as if waiting for the tide to take you to shore. But, until one chooses to grow beyond what their past dictates of them, the fruit of who we were meant to be dies away before it has a chance to blossom. Last night as I went to bed, I was exhausted. Literally and physically worn out. The early evening hour seemed as though it was past midnight, yet I still had four hours to spare. It didn’t matter. I filled the day to capacity and needed rest. In waking this morning, one minute before the alarm, I was refreshed and eager to go about my day that had an appointment and errands to be run. Then, after thinking about some things that my husband had shared after he had read my blog posts over the past few months, I decided it was time to share my writing beyond the comfort of a blog. I have always been one to go out beyond what my past may have dictated of my future, developing the person that I have felt led to be. When others have said “no” I have responded with “why not?” When told there is no other option, I have been prone to look beyond the norm and seek alternative answers. Today I chose to ask our local newspaper about providing freelance articles. Not really sure my style of writing is what they were looking for, I still decided that I would never know the answer unless I asked. Seriously, what harm came to me when I asked? If you consider a handshake, a smile and warm response to be painful, then I guess my pain tolerance is higher than most. I did not leave with a definitive answer, but I did leave knowing that I stepped out of what could have been my “comfort zone” of just blogging my thoughts away, while working on a book I am writing. I love writing but it does not mean that others will love what I write or the style in which I choose to express myself. I am okay with that, as there are many writing styles to be read. Today I made an opportunity for myself. We all have opportunities. It takes a desire to reach beyond what might hold us back, so that we can become who we were meant to be. 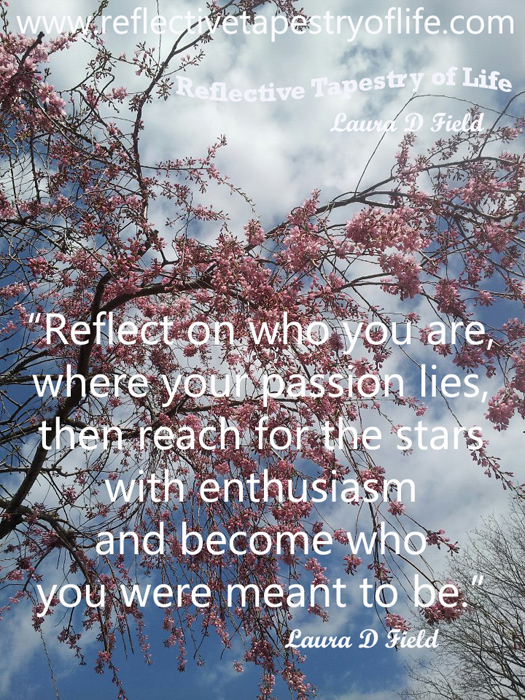 Reflect on who you are, where your passion lies, then reach for the stars with enthusiasm and become who you were meant to be. This entry was posted in Growth, Life, Positive Thoughts, Today's Thoughts and tagged choices, life, opportunities, reflective, taking, tapestry. Bookmark the permalink.